Applicable on EMI transactions too. Only thing to note with this promo is that there is a possibility that the stores might not have registered properly under electronics/apparels MCC category. So do the transaction preferably in big stores where you could be sure that it wont go wrong. And just incase if it goes wrong, keep the bills ready which “may” help. Why its a Great Promo? First, for jet cards, you’ve the ability to earn upto 53% (as JPMiles) on Diners Jet Card and even for other HDFC Jet cards you get grand amount of JPMiles. So this is an awesome news for those who’re holding Jet cards as its usually rare to see promos on Jet Cards. Note: This is a stand alone offer and you can continue to get 10X on Smartbuy txns & 10X on Diners Merchants as applicable. Two offers cannot be combined as you might already know. Every bank send out Offers mainly because they want you to spend on Apparal & Electronics as that’s when they could stretch your spending habit, resulting in some txns being converted to EMI’s. So this offer is here for the same reason and i also see other banks would follow this type of promos in future. While that’s a nice promo, i still wish to certain extent that HDFC comes up with some kind of spend based promos too in future. What’s your take on HDFC Happy Hours Festive Promo? Feel free to share your thoughts in the comments below. Can one double dip on this with the 10x on smartbuy? Also how is offer communicated. I did not get a mail on this. So wondering if this is targeted in anyway. How do we figure out the category of online merchants like Flipkart/snapdeal/amazon? We can still use JetPrivilege portal to get added value above from HDFC offers. Now I got the mail. This is very very important since most of the people are from metro cities and it makes almost 90% users ineligible. You got it wrong. What they mean is the offer was opened to those location 3 days before. Its a targeted one it seems. how to restart hdfc promotional emails,.? Might have clicked unsubscribe long time back. Only way I am aware of is to reach out to your RM and ask them the credit card offers signup form (apparently there is one such form). The DC support team told me that. @Abhinav Jain: Did you get this form and activate promotional emails? what is the exact name of this form? @Siddharth and other members: did you try this method for getting back HDFC credit card promo/targetted offers email? Even I have received same offer but as per T&C, the cashback earned from 20th Sep to 30th Sep should have been posted by 15th Oct but it has not been posted yet. Have you received the cashback for the mentioned period? I have maxed out Smartbuy(25K points) and 10X on select partner brands(25K points). Can i still get more points by spending offline(Lifestyle) ? A quick note for others, you will not get 10x points for online spends at sites other that Flipkart, Amazon and Tatacliq. Other websites like snapdeal.com will be registered as general seller and not an electronics or apparel. I got this confirmed from the bank. So better stick to big stores or the three partner websites to get this additional 15k points. Amazon/Flipkart is also a general seller and not just limited to apparel/electronics. HDFC customer service representatives are highly unreliable as you can’t quote them later. This is a separate offer , if you spend 45000 at lifestyle, you will receive 15k reward points within next 90 days. Yes. You get an extra limit of 15k for points earning. Yes, this offer is a separate one and would count outside the 25K+25K usual limits. @sameer How do you classify electronic and apparels ? I wanted to buy a laptop on paytm – they give gst invoice + cashback + HDFC 10x would make it a real deal! 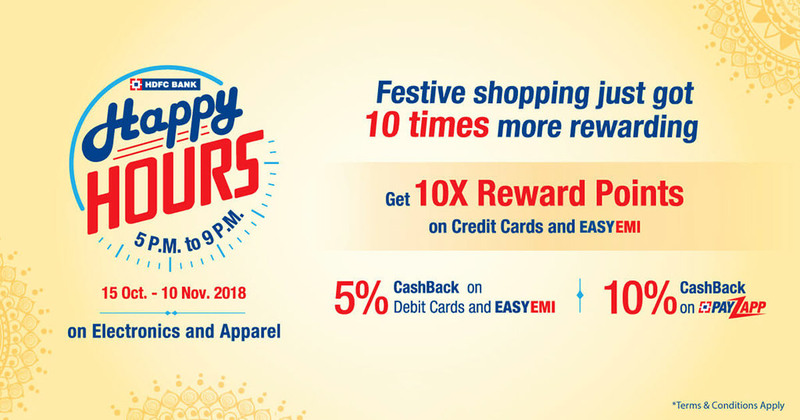 Any idea if shopping on paytm mall between happy hours would classify for 10x or not ? Do not buy from Paytm as the transactions would not be cosidered for the reward points. I made payment of LIC insurance of having premium of 28320, but they have not credited single reward point to my account. i called the hdfc helpline today as i have exhausted regular 25k limit on tatacliq. They said you wont get 10x points on any of the 10x partners for diners (extra 15k) if you already used the 25k points. Can somone confirm this? In the offers page posted at HDFC bank site , there is this excellent offer on the jewellery category. Getting instant additional discount over and above merchant’s offer ( validity 10th october-11th november ) plus 10x on all jewellery spends over 20K on 4th & 5th November,2018 ! No cap mentioned … THIS IS HUGE !! If we buy on November 4 &5 in Kalyan Jewelry, we get 5X and on the top of that 10x, that translates into almost 50% am I correct? Did anyone receive the additional points/JPmiles? Looks like 20th Feb is the fulfilment date for this Diwali promo. Is any one received points ? Received the October Amazon points after i raised complaint with the customer care. They took the order nos. and raided a complaint. Can some one confirm me if they have received for purchases on TQ during happy hours ? I did not get and upon asking customer care, they said no two offers can be clubbed since you received 9x rewards for direct merchant and you will not be eligible for the happy hour points . In fact i made > 1L txns, technically only 83K is eligible for direct merchant, rest should eligible for Happy Hours and I should get points for those. Unfortunately no. I enquired this scenario and they denied. I dropped the idea. I received points on my Regalia but still waiting for Jet card.